Inspired by planetary movements and the space-time continuum, Opus X captures the shape and dimensionality of time through the synchronous rotation of circular motions. Replacing a traditional fixed dial and watch hands, time is displayed as system of rotating indicators mounted on a revolving frame. Presenting a new technical challenge, as the frame completes a full rotation, the dials of each indicator turn in the opposite direction, ensuring orientation remains constant in any position. Recalling the celestial mechanics of the solar system, the hand-wound mechanical movement functions as a planetary gear train, consisting of solar wheel, satellite wheels, and frame. The indicators for hours, minutes, seconds, and secondary timezone, are set on the individual satellite wheels, which orbit around the central, solar wheel. Each indicator is set at a slight incline, allowing the dials to follow the curvature of the case, while ensuring fluidity in rotation. The frame is driven separately to complete a full rotation in 24-hours. Creating coherency throughout the design, the 72-hour power reserve operates as special planetary gear train, in which the diameter of the satellite wheel equals the radius of the crown wheel resulting in a linear indication. Balance regulation and chamfered bridges enhance the stability and functionality of the power reserve. A transparent backing shows the geometric precision and beautiful finishing of the movement. Modern and pure, 46mm white gold case is designed without a bezel, adding light and transparency to the design. 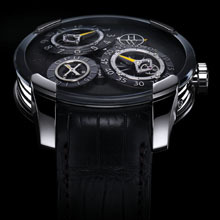 Attached directly to case, rounded sapphire crystal enhances the overall visibility of the dial animation. 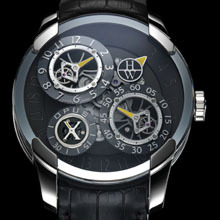 In the collaborative tradition of Opus, the names of both partners – Harry Winston and watch engineer Jean-François Mojon – are marked on the bottom of the case. 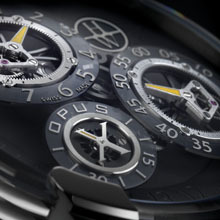 Pushing the innovative extremes and challenging the perceptions of time, the resulting design is a groundbreaking accomplishment that is the essence of the Opus Series. JEAN-FRANCOIS MOJON: Fascinated by engineering from a very early age, Jean-François was introduced to the watch making trade through his father, who worked in the technical watch business. After earning his diploma in engineering and microtechnology in Le Locle. Mojon joined the industry working on research and development of movements and new complications for several international timepiece brands, including Swatch Group and IWC. In 2005, he began his own company, Chronode SA. Specializing in the development of high complication movements, the company is based in Le Locle, Switzerland. The historic heart of Swiss watch making, the industrial epicenter sits at the cross roads of timepiece tradition and modern innovation– the perfect place to continue the Opus experience.